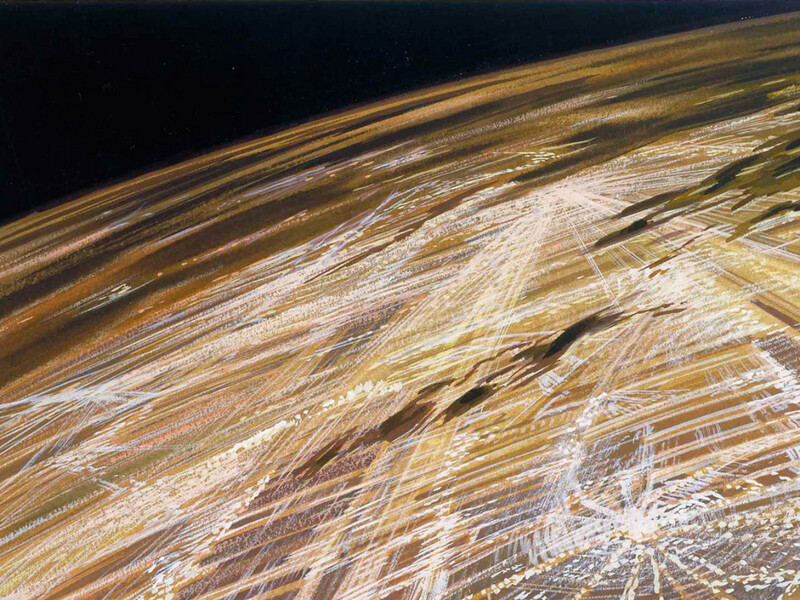 Look back at amazing concept art that helped visually define the Star Wars galaxy. Although McQuarrie only directly worked on the first three films, his presence would be felt for years to come. 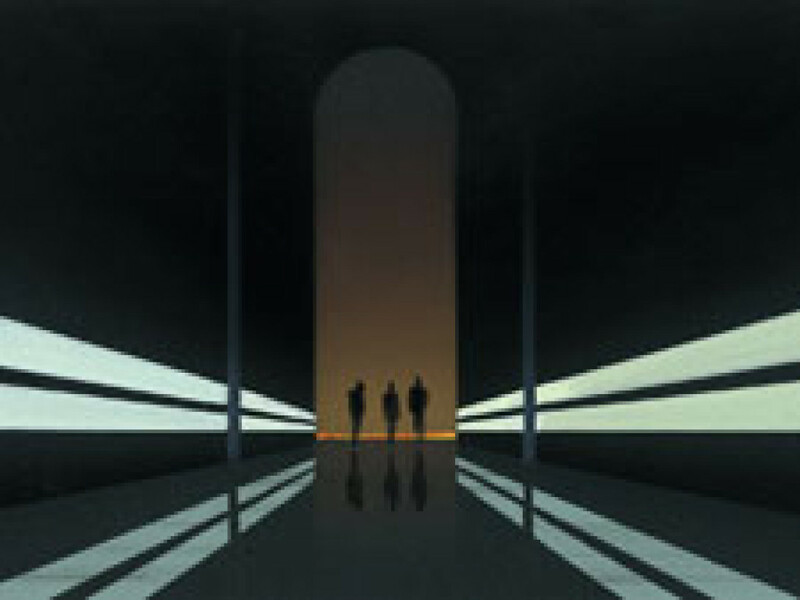 When artists Doug Chiang and Marc Gabbana began working on concept art for Episodes I, II and III, they often found themselves asking, “What would Ralph do?” In addition to creating original artwork, Chiang, Gabbana, and many other artists looked to unused and unfinished concepts from McQuarrie’s work on the previous films, allowing his legacy to inspire them. Whether the artists on those films tried to echo McQuarrie’s style or tried to make sure audiences would see wholly new things they’d never seen before, his work established the visual feel in countless ways. Supervising director Dave Filoni also dug deep into the McQuarrie archives to help him flesh out worlds in Star Wars: The Clone Wars, as well as finding ways to include his personal favorite pieces of McQuarrie’s that he’d been familiar with for years. 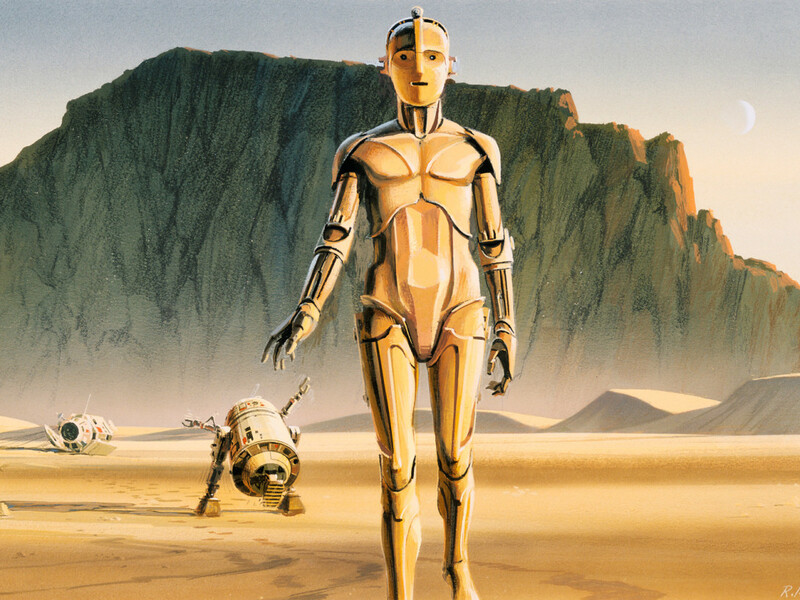 To this day, McQuarrie’s work continues to inspire not just The Force Awakens and Star Wars Rebels, but science fiction fans across the world. Among his great works, here are some standouts. 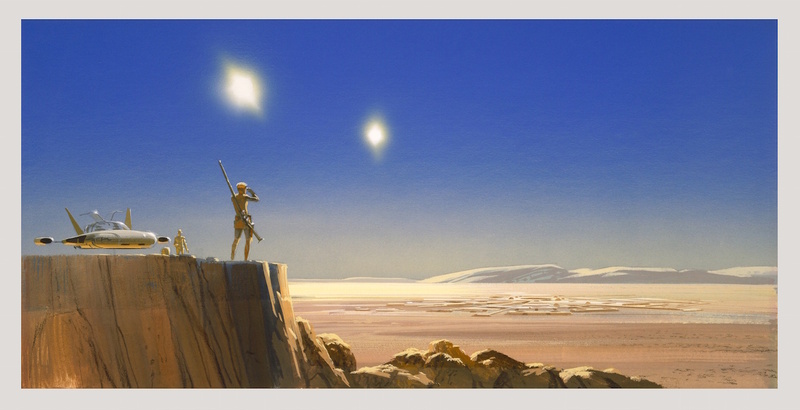 The first completed painting for Star Wars, this image conveyed amazement and wonder in its landscape but also a loneliness and vulnerability with its mechanical subjects. Reminiscent of Maschinenmensch from Fritz Lang’s Metropolis, the focal droid needed to convey a familiar humanity but also a calculated sophistication. In the background, the smaller droid and its many utilities showcased the vast array of tools at a helpful robot’s disposal, a feature that made R2-D2 a reliable companion. Looking upon this image instantly transports viewers to a world both bizarre and recognizable at the same time. The rocky desert landscapes evoke horizons similar to those seen in Death Valley, CA, where insert shots were filmed, but the floating car and dual Suns are just otherworldly enough to create a sense of unease, strange and futuristic. A master of perspective, McQuarrie could instantly show the sheer size of objects with his deliberately placed recognizable figures. The angular designs of both the alien vehicle and massive space station show a unification and commonality of both design and materials, helping to bridge objects that would have been created by drastically different designers. Deak Starkiller’s confrontation with Darth Vader showcases the sheer size of the villain, who completely dwarfs his opponent. McQuarrie’s interpretation of the villain’s presence even makes the ship surrounding him feel smaller. In later drafts, Starkiller became Skywalker, but this image shows that both characters utilized breathing apparatuses to make transitioning from ship to ship a much easier process. The look of Starkiller was heavily changed, but other than rounding out some sharper angles, this image represented Vader so powerfully that very little modifications were necessary to bring him to life on screen. This image is another example of seemingly small differences from the final film that, in hindsight, feel drastic. We see stormtroopers wielding shields, a different character design for Chewbacca and, most notably, a lightsaber serving as a standard issue weapon not one reserved for only Jedi Knights. Despite these differences, the cold, bleak hallways of the Death Star and also the seeming invulnerability of the elite stormtroopers from this image’s core concept remained constant. 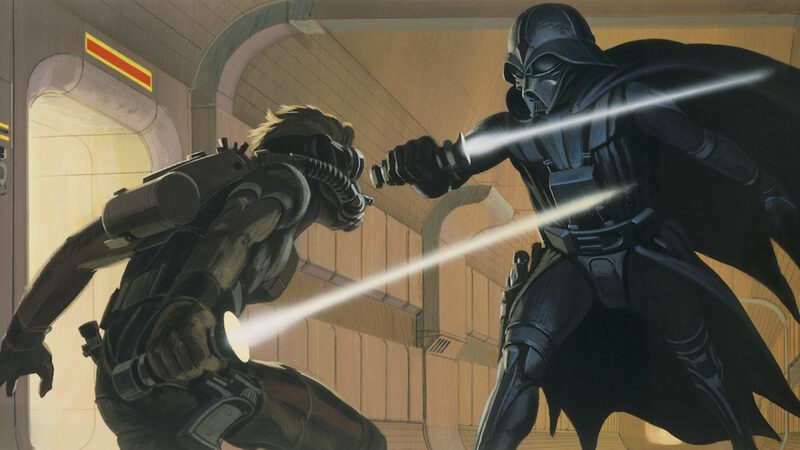 Looking back at this image, one can’t help but wonder what the films would have been like had lightsaber battles broken out amongst the most common of foes. In contrast with science fiction films of the time, which imagined the future and distant worlds as sterile utopias, Lucas and McQuarrie showed audiences a world that had its own history and had its own character. The technology of this world wasn’t always sleek and smooth, but had rough edges that showed a state of disrepair or exposed that upgrades had been made. 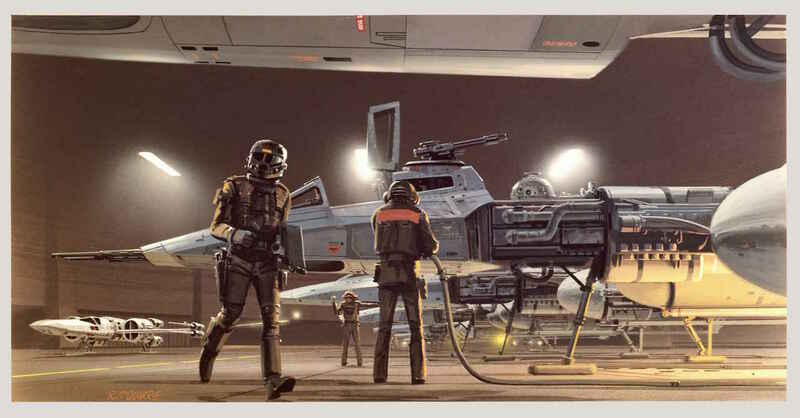 In a stark divergence from the streamlined and efficient Imperials, McQuarrie emphasized how the Rebels needed to relocate to evade the Empire, making their hangars functional more than fashionable. The “lived in” world of the Rebels more closely resembled a mechanic’s garage than a highly organized military faction. In 1977, Star Wars showed us desert planets, forest bases, and nefarious space stations, but The Empire Strikes Back gave the filmmakers an opportunity to showcase just how vast and diverse the galaxy was, not just in environments but also in characters. Dagobah and its dense swamps made a perfect hiding place for a Jedi Master trying to lay low, especially if that Jedi Master’s stature was already quite low. 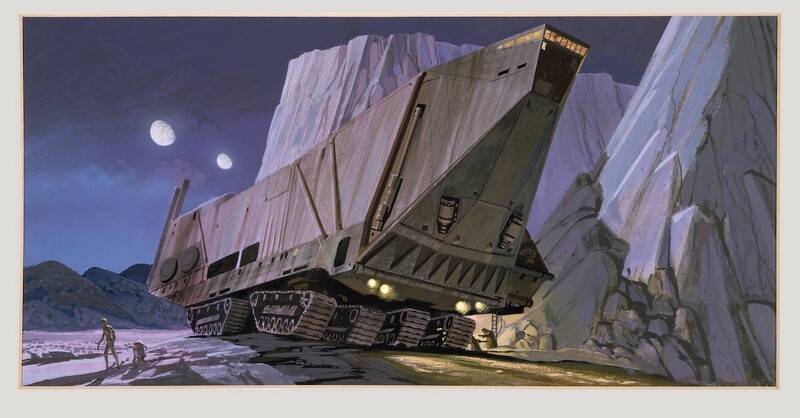 This McQuarrie image, much like each shot of Dagobah in the film, gave you only a hint of what sort of mysteries could exist on such a planet, while also relieved that you’d never have to visit such an inhospitable place. Originally intended to be the gas planet Alderaan, McQuarrie envisioned a sophisticated society that hovered above a planet instead of inhabiting it. The dramatic vision of clouds radiating from a system in waves up into the atmosphere was used instead for Cloud City, proving how resourceful McQuarrie’s art could be. The concept is so powerful and evocative that Obi-Wan’s arrival on Kamino in Attack of the Clones strongly echoes a mechanical station immersed in waves crashing all around it. 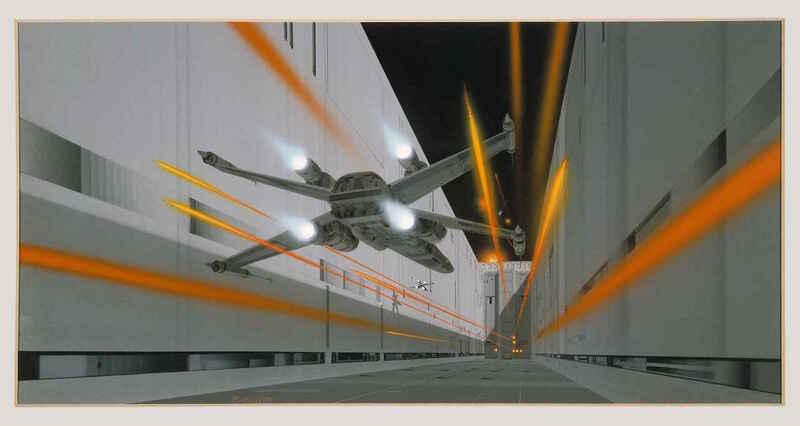 McQuarrie proved time and time again that not only could he work with Lucas to create fantastical creatures and environments, but he also had a firm grasp on the art of filmmaking, using angles and perspectives to help exhibit awesome action in a static image. 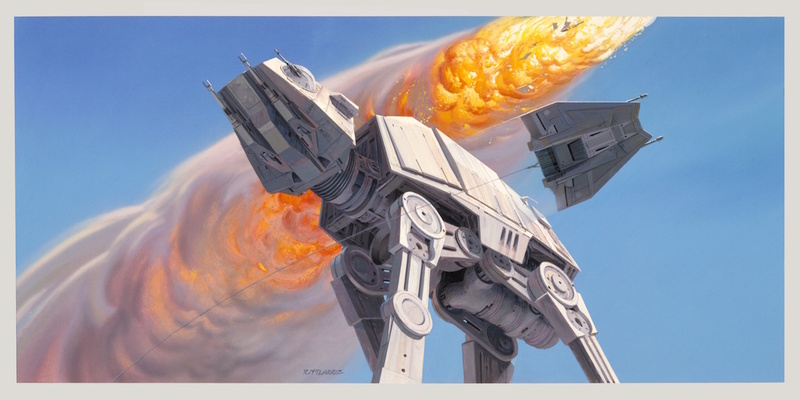 From a high-speed assault through mechanical trenches, to a confrontation between the agile and powerful on a snowy planet, to a frenetic forest chase, McQuarrie’s mastery made it looks like these objects could fly off the canvas at any moment. 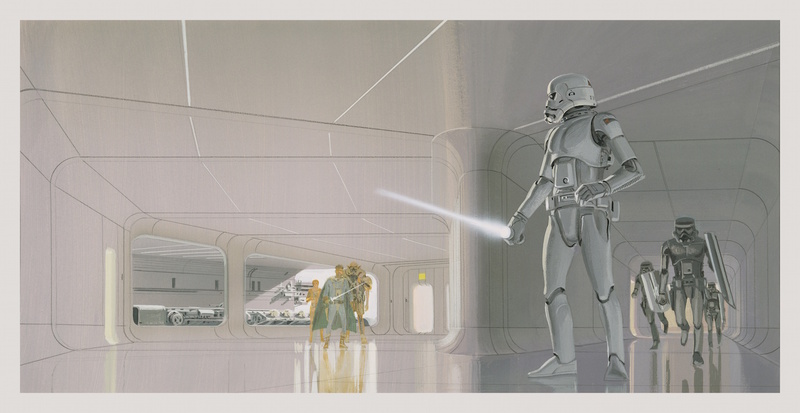 Which of McQuarrie’s images is your favorite? Voice your pick in the comments below! 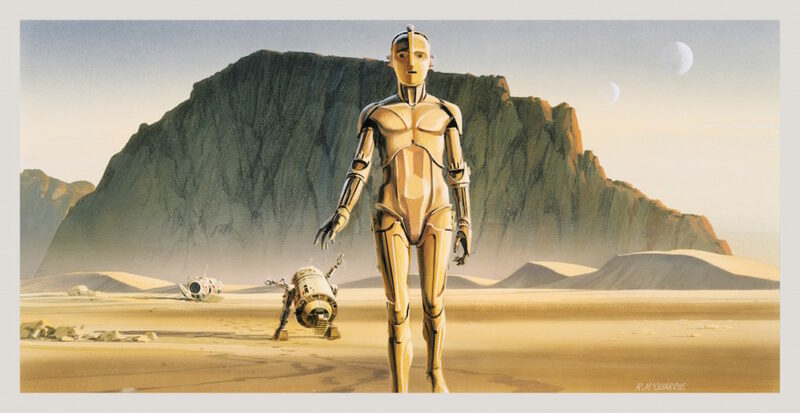 In Star Wars Art: Ralph McQuarrie, readers will find the most definitive collection of the artist’s Star Wars work ever assembled, including hundreds of never-before-seen illustrations. Rare unpublished interviews, as well as recollections from McQuarrie’s colleagues and friends, complement and contextualize the art. 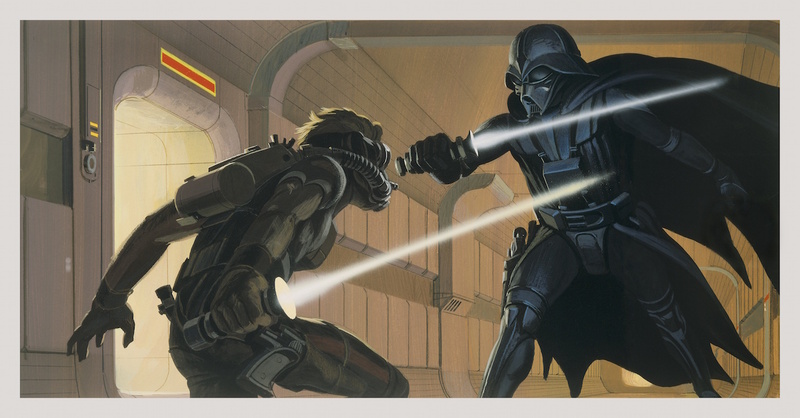 Star Wars Art: Ralph McQuarrie is a comprehensive tribute to cinema’s most beloved and influential concept artist. The book is available for pre-order now. 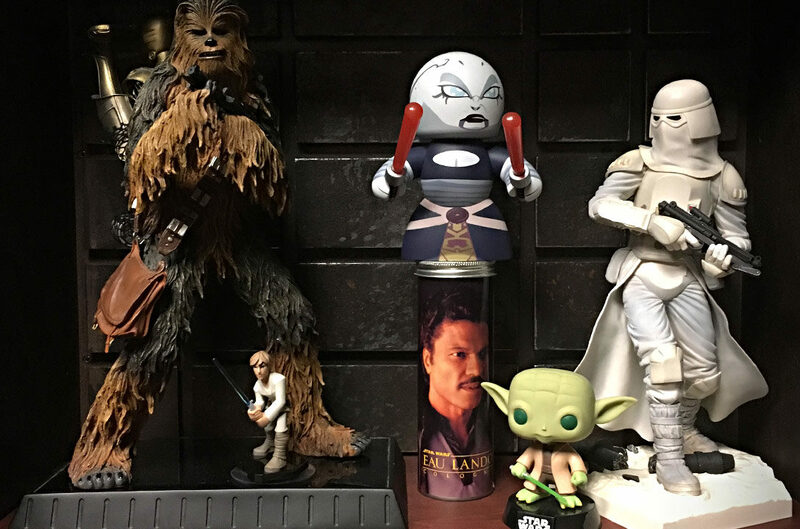 From Ackbar to Zuckuss, Patrick loves all things Star Wars. 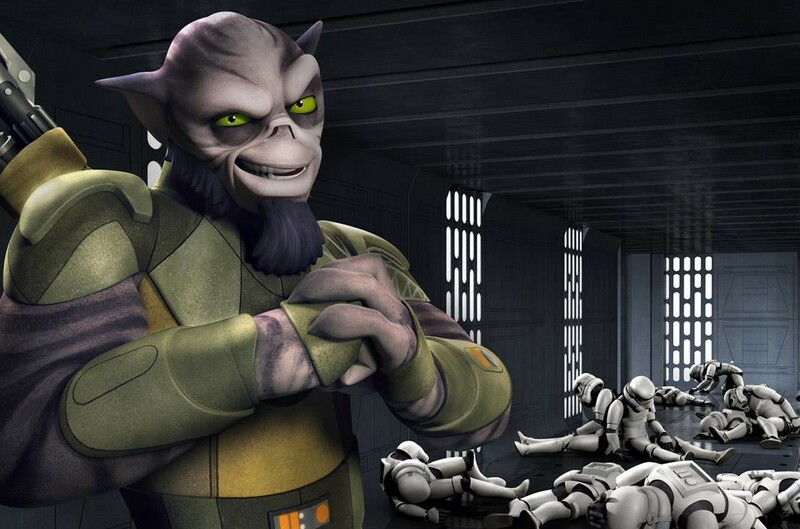 He has sworn to use all profits from selling his script “Who’s the Bossk?” to bring back the Decipher CCG. For more of his musings on Star Wars, horror movies, and comic books, you can find him tweeting as @TheWolfman.